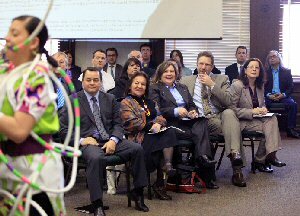 OTTAWA, ONTARIO--(Marketwire - March 31, 2010) - The Honourable Chuck Strahl, Minister of Indian Affairs and Northern Development and Federal Interlocutor for Métis and Non-Status Indians today marked the 50th anniversary of the right to vote for First Nations. "This is an important milestone and a cause for reflection," said Minister Strahl. "It was under the Diefenbaker government that the Canada Elections Act was amended to extend the right to vote to First Nations individuals back in 1960, and today, this government is moving forward to protect the rights of Aboriginal people." The right to vote was extended to First Nations people when the Act to Amend the Canada Elections Act (http://en.wikipedia.org/wiki/Canada_Elections_Act) passed into law. This amendment removed discriminatory parts of Section 14 of the Act and received Royal Assent on March 31, 1960. It came into effect on July 1 of that year. The Government of Canada is building on this historic legacy with several recent initiatives to ensure that Aboriginal people enjoy the same rights and freedoms as all other Canadians. They include the amendment that was made to the Canadian Human Rights Act, proposed changes to the Indian Registration Act that reflect gender equality, and a proposal concerning matrimonial real property. "Canada has shown significant leadership in protecting the rights of First Nations, Inuit and Métis peoples," said Minister Strahl. "We will continue work to advance and uphold the rights and freedoms of Aboriginal peoples at home and abroad."